An excerpt from my MA Learning Agreement; a statement of intent for the Final Major Project. 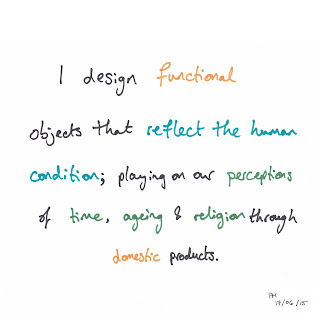 My research during the Material and Emotional Values of Product Design unit led me to explore my initial design ethos of passive and humble products through investigation into the ageing timepiece - a product that adapts or changes over time, allowing personal reflection on our individual perceptions of time. Through the initial idea development of the previous unit, I began to consider our own relationship with the world around us and our inner sensitivity to the natural world. My ambition for my future professional practice is to continue to develop products that echo the human condition. I believe that the reflection encouraged by a product and the interaction we have with it allows us to build sustainable relationships with products, relieving the environmental pressures of consumerism while promoting a deeper connection with our own personal environments. To better understand these concepts, I will be supplementing the design process of the project by studying a range of philosophical theories encompassing humankind’s spiritual connection with the natural world, and our perceptions of the passage of time. 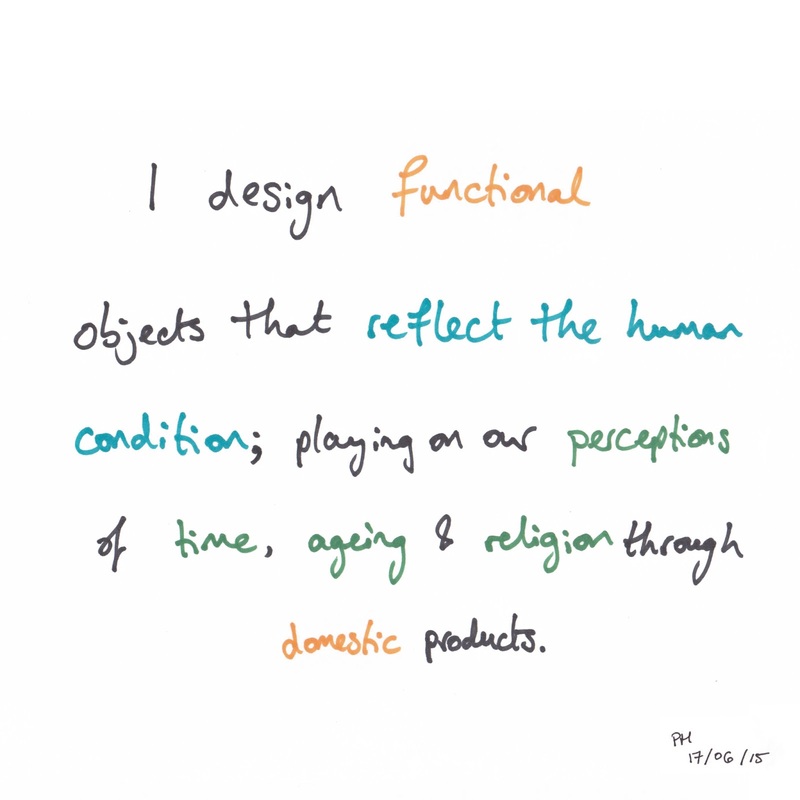 My product focus is to produce a range of objects to reflect my interest in producing functional products that reflect the human condition. These products may also include digital and mechanical technologies, utilising the strengths of my own background in Mechanical Engineering. Though my aim is to ultimately produce domestic products, I am also interested in producing pieces that would be suitable for gallery exhibitions, and as such I will be targeting this market to identify an external professional collaborative partner. Due to the philosophical nature of my research, I believe my ambition for my Final Major Project aligns with the MA learning outcome. Undoubtedly, due to my engineering background, any functional products I design will be analysed in-depth technically, but I believe that the deeper meaning to the product is the more important factor and so I will be striving for an MA classification, as opposed to the MSc. It is my intention to submit a range of functioning prototypes that encourage reflection on the human condition and thus meet the conditions of the MA learning outcome.